I was a little frustrated that I couldn’t find my 1-100 number chart when I needed it. I know I had touched it several times earlier in the year when I didn’t need it. I looked in a few obvious places, then gave up. Using a piece of posterboard, I just markered in the first rows of numbers. As I taught Rebekah how to count by tens, I filled in a few columns. Then, I had her fill in the rest of the rows. and enjoyed being able to use the PERMANENT Magic Marker. but it worked. Sometimes my rubber bands are just too tight. than just reading along with the store-bought chart. so I will use it to reinforce the concept. 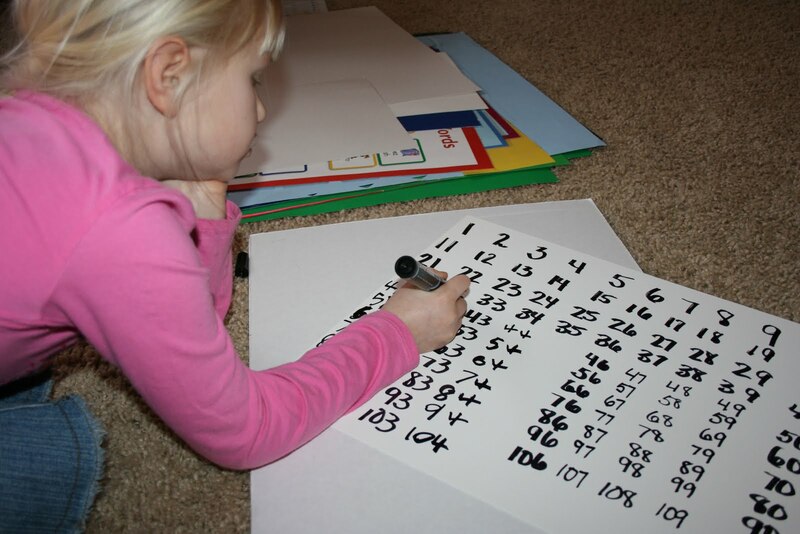 This entry was posted in counting by tens, first grade manipulatives, home schooling first grade on February 3, 2010 by Mindy.